A Black-Headed Pitta in Malaysian Borneo. The South East Asian country of Malaysia is not only rich in general wildlife, but more specifically also has a large number of native birds. Of these, the Black-headed pitta, the Little Grebe, and the Eurasian tree sparrow are quite widespread. Bright in color, the Black-headed pitta is a ground-dwelling bird. With a black head and a crimson belly, the bird is very attractive. It also has a narrow blue stripe that extends from the back of the eye. Blue color is also at the bend of both the wings. The Little Grebe is another popular native Malaysian bird. Its scientific name is Tachybaptus ruficolli. It is a water bird. It has a patch of light brown color on its neck. However, from a distance, the little bird appears black. It also has a light-colored rear that makes a good contrast with the rest of the complexion. One of the most commonly sighted native birds in Malaysia is the Ciak Rumah, also known as the Eurasian Tree Sparrow. Its head and feathers are brown in color while the cheeks, and the belly are in pristine white. It also has a black patch on its throat. Lowland tropical forests are the natural habitats for Black-headed pittas, while open ponds with floating reeds provide the habitats for Little Grebes. One can also find these native birds in large pools and marshy waterways. In a stark contrast to these two birds, the Eurasian Tree Sparrow is an urban bird with its nest in natural cavities or in a hole within a building. The black-headed pitta can make a very distinct whistle that usually lasts for a few seconds. Little Grebe also has a distinct characteristic behavior, and it is never allowing its eggs to be seen easily by others. Either, it will conceal the eggs by some weeds or wait for her partner to seat over the eggs. The Eurasian Sparrow, on the other hand, has a distinct shrill voice and its chirps make a musical sound. Sometimes, they also lay their eggs in the nests of other birds. The back-headed pitta mainly feeds on a range of invertebrates, such as spiders, ants, snails, beetles, and cockroaches. Little grebe also has more or less same dietary comprising of insects, larvae, small fish, beetles, snails, and crustaceans. On the other hand, the Eurasian Tree Sparrow being urban bird feeds on grains, grass seeds, insects, and fruits. In Malaysia, there have been multiple efforts for the conservation of these and other native birds. One such effort was the establishment of the Danum Valley Field Center (DVFC) in the 20th Century. 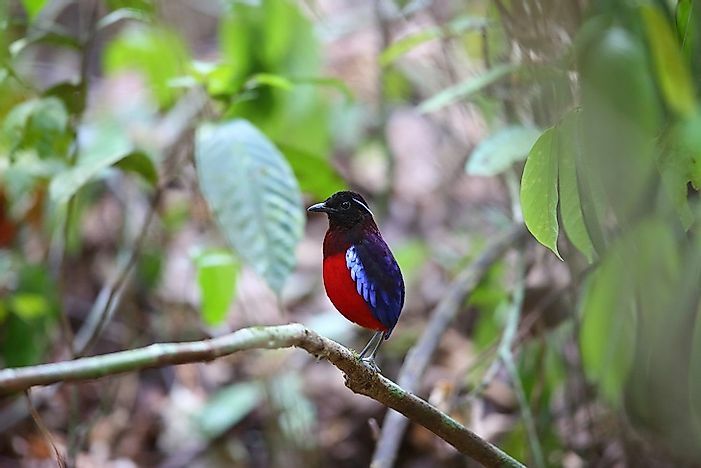 The DVCF provides a natural habitat for many birds, including the black-headed pitta. There are also a large number of bird sanctuaries in Malaysia such as the Kuala Gula Bird Sanctuary, the Kuala Lumpur Bird Park, and several more. Rapid deforestation has posed a large threat to the existence of these native birds in Malaysia because it results in the loss of their natural habitats. Nonetheless, the Eurasian Sparrow has adapted itself well to urban settings. It is currently not facing any significant threat of extinction.